Yesterday one of our remote PC’s after a rebuild was having problems with its windows activation after having a look round trying to find a solution we came across a handy bit of software to activate the system from another identical system. 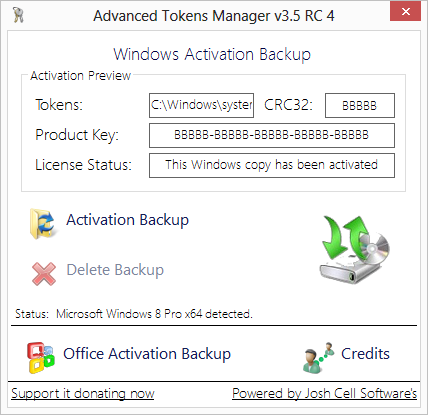 Advanced Tokens Manager is an easy to use application that helps you with the activation backup and restore. The application is able to make the full backup of all activation data stored on the computer for a trusted restore without damage or modify the activation system. * All editions, versions and Service Packs. Last week in the office we ran a update on a old application on one of the PCs in the environment, but your command doesn’t execute. Instead, an error popped up telling us that the application could not be updated. So to find the answer I had to refer the “helpful” FAQ section of the application website which did not turn up any results so a quick goolge search turned up the following. Windows Installer CleanUp utility can be download from the follwing location. The Windows Installer CleanUp utility deletes all files and registry settings associated with a program’s Windows Installer configuration. It’s important to note that the tool does not remove the program’s actual installation files or registry settings. Nor does the tool replace or supersede the Add/Remove Programs command. A couple of Microsoft Office handy plugins that should help any Frustrated IT Engineer make their IT day work that little bit easier and cut down on those Microsoft Office call’s. The Add-in works with Outlook 2007, 2010 and 2013. The ribbon was Microsoft’s new interface in Office and it caused much confusion and a increse of helpdesk tickets especially when moving from office 2003 to office 2007 and above. ” Cloppy v2.0″ / Ribbon Hero, once installed will help your user base navigate and use the ribbon more effectively and be download from the following link. You do not have the necessary permissions to use the ‘.mdb’ object. Have your system administrator or the person who created this object establish the appropriate permissions for you. Well once again Chris Stark has come to rescue with a great solution to the problem click the link below to go to his website and find out how to correct the problem. Open the “Open” node and left click on the “command” node. You should see two entries “default” and “command” in the command node. Take a look at this handy method that lets non-admin users to activate office 2010 manually.